Happy Monday! Mondays are just the BEST because it is time for another Technostamper Monday Lunchtime Sketch Challenge. Mary Jo has another FABULOUS sketch for us and I had so much fun making this card. I finally broke down and got “A Happy Thing” Sale-a-bration stamp set. Not real sure about the bird but I do LOVE the lemon! I thought it would look pretty good cut out on this. Best Year Ever (SAB) dsp – 3 3/4 x 5. Add to card front. Whisper White – 2 1/2 x 3. Round the corners and add to card front using dimensionals. 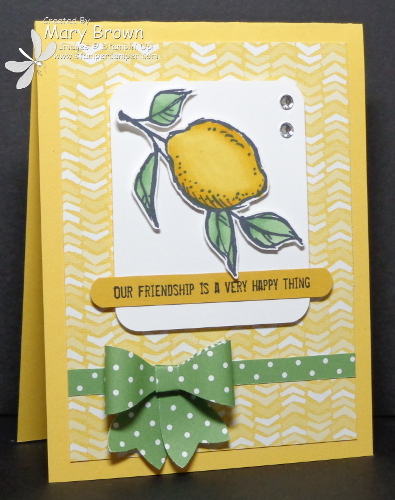 Stamp lemon using Memento Black, color with Daffodil Delight and Wild Wasabi Blendabilities, cut out and add using dimensionals. Hello Honey – 3/8 x 3 1/2. 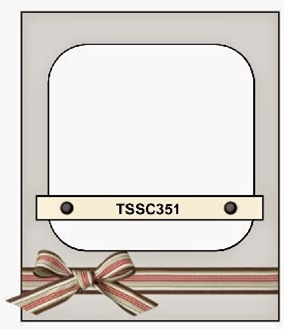 Stamp greeting using Memento Black, round corners using Word Window Punch add to panel. Wild Wasabi dsp – 1/4 x 3 3/4 and add to card front. Bow Punch – Wild Wasabi dsp, make into a bow and add to card front. LOVE this sketch…hope you can join the fun! Don’t forget to check out the other members of the team and remember go to the Technostamper blog to play along! 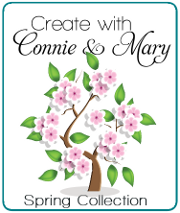 Create with Connie and Mary Spring Collection 2015 just started its second week and it’s a GREAT time to subscribe! Our subscription is full of gift ideas, home decor, card sets and 3D project tutorials perfect for your stamp camps and classes! We’re using Occasions and Sale-A-Bration products from Stampin’ Up!’s Catalogs. Get over 24 projects for only $29.95 US…that’s just a little over $1 per tutorial! More details over on Create with Connie and Mary! This entry was posted in Sale-a-bration, Technostamper Challenge and tagged A Happy Thing. Bookmark the permalink. Super cute, I finally ordered this set tonight, lol. I too love the lemon and it looks great with these papers. You are so talented. So happy you are part of the TSSC team. Thanks so much.